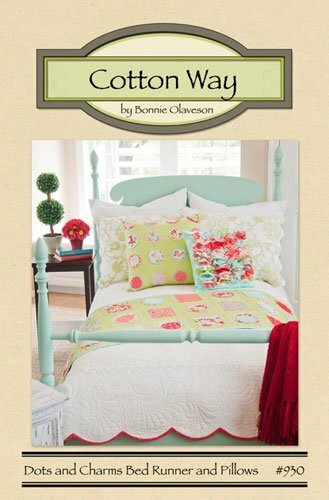 Dots and Charms Bed Runner and Pillows by Bonnie Olaveson for Cotton Way. Instructions include patterns for Bed Runner and Pillows. Charm Pack Friendly. #930 Dot Pillow 20in x 20in, Charm Square Pillow 16in x 16in, Bed Runner 22in x 76in All very quick and easy. All soft edge. Change your whole room with just a switch of the pillows and bed runner.